Wolf Haas has written seven novels in his Simon Brenner series; Resurrection is the first novel. Haas has a different but cool, quirky sort of writing style not often found in standard crime/mystery fare, with a story that has a number of meandering but often humorous digressions that hide a rather ingenious crime and the keys to its solution. It is also the introduction to an ex-policeman turned PI who is all too human but who sticks with his work until it's finished, despite his own personal shortcomings. And because it suits my need for trying to stay out of the mundane in my reading, I had a great time with this book. Simon Brenner is a 44 year-old ex-detective inspector ("or whatever his rank was") who has recently left the police after a nineteen-year career. 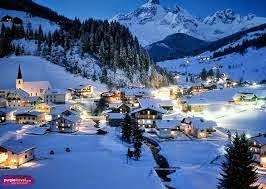 He's on the same case he was working when he left, the strange affair of two elderly Americans found frozen to death in December on a chair lift in Zell am See, a popular ski area in the Austrian Alps. The Americans were factory owners in Detroit, and inlaws of Vergolder Antretter, the "richest man in Zell." As the reader learns in the first two chapters, Brenner solved the case only after three-quarters of the year had gone by, not for the police, but for Vienna's Meierling Detective Agency, contracted by the Americans' insurance company. The police case had stalled in January; by March, as a PI for Meierling, Brenner was back. Suffering from pounding migraines, he works his way through this case with no evidence or leads; all he has is a seemingly unshakable alibi of one of the suspects given by a man who's just been released from a mental hospital. Using the alibi as a first step, Brenner ends up being awed by a woman with thick bifocals who gives him a ride in a car despite the fact that she has no hands, is sent to and falls in lust with a gorgeous schoolteacher who may have some important information for him, butts heads with an ambitious but annoying local reporter, and even comes up against his former boss again before the nine months go by and the case finally comes to a close. So far, this may seem like a typical outing in the world of crime fiction, but it most definitely is not. If the author were to go straight from point A to point B with the case, the investigation and the solution, a) there would certainly be less pages in this book and b) it wouldn't be nearly as interesting or fun. The unique narration style strikes the reader immediately. It's as if he/she is being addressed by a sardonic someone who's sitting around in a bar, looking back and telling the story, complete with comments to "you," and the normal digressions a storyteller might make in such a situation, complete with character observations. As just one example of a meandering path in this book, in describing how Brenner took a taxi ride hoping for information from a talkative cabbie, the narrator turns that into a discourse on the sport of curling, rich tourists and poor tipping, as well as the way Brenner eats a sausage on a bun. Yet hidden among this often darkly humorous, tangential material are not only clues essential to solving the crime, but there is a lot of insight into Brenner's character, the issues faced by the permanent residents in this tourist mecca, and the ugly past of this otherwise outwardly postcard-perfect area. Since I've already read the author's Brenner and God, it's pretty obvious that in this book he's just getting started on developing Brenner's character, but that's usually the case in a first series novel. The crime, once solved, proves to be cleverly plotted and I didn't guess the who or the why. I also happened to enjoy the quirkiness of Haas' writing style, but I can see how it might not be everyone's cup of tea. The story digresses and the meandering may be a little off-putting for a reader who's in this solely for the crime. However, for patient readers who are willing to take a chance on something very different in the crime-fiction zone, while it takes some initial bit of getting used to, Resurrection turns out to be a very good and quite satisfying read, punctuated here and there with bits of dark humor keeping it lively.